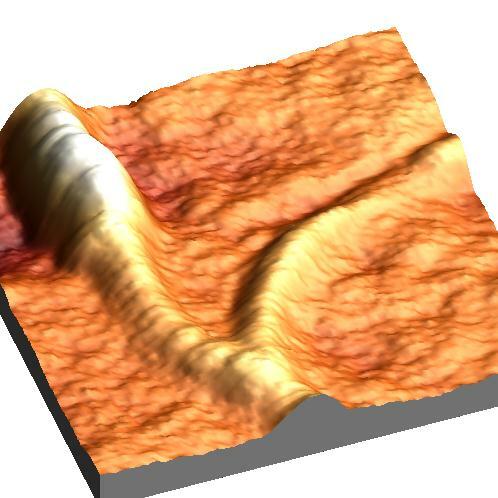 Figure 1: Artistic depiction of TERS on graphene based on a STM image. Conventional optical spectroscopy methods are unable to provide the spatial resolution required by recent rapid advances in nanotechnology because of the diffraction limit. Tip-enhanced Raman spectroscopy (TERS), as near-field optical technique, overtakes this limitation confining the electromagnetic field in a region with dimension equal to the tip apex, i.e. 10 - 20 nm. 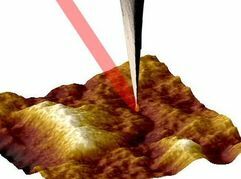 Two scanning-probe microscopy methods are used: Atomic Force Microscopy (AFM) and Scanning Tunneling Microscopy (STM). The choice between these two approaches depends on the electronic configuration of the nanostructure and on the substrate. Currently we focus on functionalized nanotubes, functionalized graphene and gallium arsenide quantum dots.